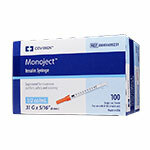 At ADW Diabetes we take pride in our fast service and large selection of quality insulin syringes at lower prices. 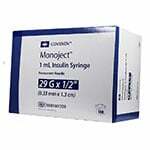 Get top brands of insulin syringes such as BD, UltiCare, Trueplus, and Monoject all in one convenient place when shopping with us. 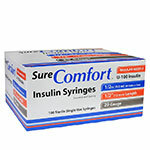 Shop our wide range of syringe sizes and brands to find the right solution for your preferences and needs. For over 10 years, customers have trusted us for the best prices without compromising on quality or service! 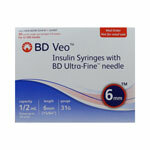 Learn the differences in syringes so you can easily maintain your diabetes care and daily regimen. Below are the main components to consider when using insulin syringes. Your physician should always advise which size is best for your needs. 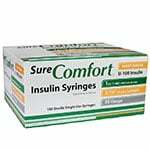 Needle Gauge: Needle gauge indicates the width or thickness of the insulin syringe. The gauge can range from 28-32 gauge. The smaller the gauge number, the bigger the thickness or width, so a 28 gauge will be bigger than a 31 gauge for instance. A smaller gauge may cause less pain and needle anxiety. 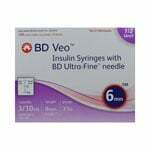 Needle Length: Needle length indicates the actual length of the needle on the syringe. The most common needle lengths are ½ inch (12.7mm), 5/16 inch (8mm), 3/16 inch (5mm) and 1/8 inch (4mm). The smaller the mm or millimeter, the shorter the needle. 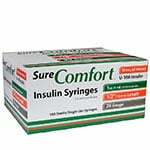 Barrel Size: Barrel size indicates how many units of insulin a syringe can hold. 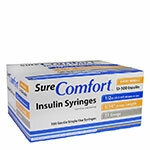 The three common sizes of insulin needles available are 3/10cc or 30 units or less, 5/10cc or 50 units or less and 1cc used for 50-100 units. 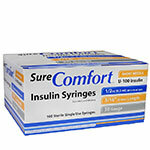 The smaller barrel for less insulin allows it to achieve better accuracy. BD Becton Dickinson is one of the leaders in diabetes care. 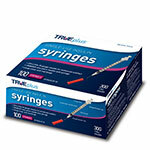 They develop easy to use, high-quality syringes. Becton Dickinson offers advanced safety in their products to protect healthcare workers and patients. 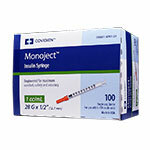 Monoject offers a full range of high, quality insulin needles. They look to the future for even more improvements in development. 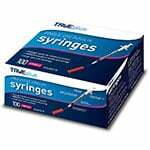 TRUEplus by Trividia Health offers affordable, quality insulin needles in a variety of sizes for added comfort. 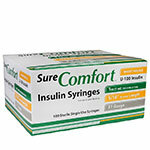 Sure Comfort of Allison Medical is known for quality and competitive pricing along with a wide offering of insulin syringes. 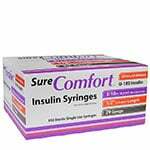 Always use the correct size for your individual needs based on the instructions provided by your diabetes health care provider. Never re-use a syringe needle. The needle will become dull and lose the outer lubrication after the first use. 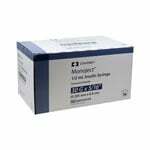 This will make for a more painful injection with an increased risk for infection. 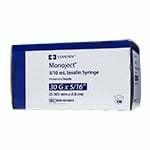 Remember to monitor and keep track of your blood glucose levels. Always wash hands with warm water and soap prior to injection. Dispose of needles properly following your local ordinances. Call your local health department for more information. You can also purchase proper needle disposal containers. Remember to rotate your needle injection sites to prevent skin injury, scarring and help with absorption. 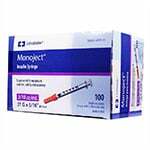 Common injection sites are the abdomen, upper, outer thigh, and upper hips or buttocks. If you have any questions regarding the solutions we offer, please contact us for further assistance. Our team would be happy to help in any way.